I'm a wanna-be DIY home decorator. It's true. I can't sew, so I use the term "wanna-be." If I was "for real," I would be able to sew. I'll get there one day, but for now, I'm just a wanna-be. So, I L-O-V-E it when I stumble onto ideas that don't require a lot of sewing know-how on my part. I may have mentioned that we're doing a kitchen remodel (haha), and a LOT of our extra financial resources (aka "moula") has been going toward that. Because of that, I've been trying to find frugal, free, and budget-friendly ways to spruce up the rest of our house. 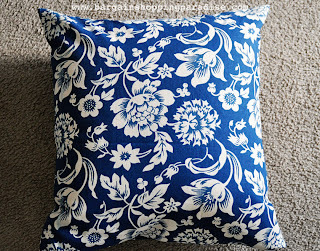 When I stumbled onto this no-sew pillow cover tutorial from Heidi at Budget Wise Home, a little thrill ran through me. No-sew . . . really?! That sounds like something I can do! I'm sure I didn't end up following her directions to the "t," but I used the same general idea. I grabbed some heat-activated hem tape from my local Joanne Fabric, along with some heat-activated Velcro. 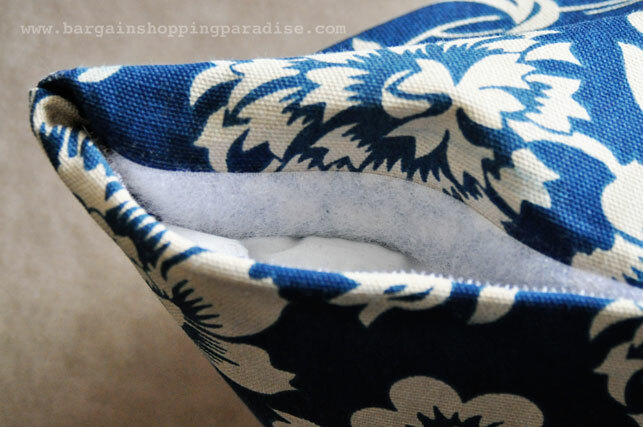 I used the hem tape along three of the seams of the pillow, and used the Velcro on the other, so that I could take the cover off and wash it or change it out. I believe that the hem tape and Velcro ended up costing me somewhere around $7, all together. The pillow form itself was a Goodwill find for around $2.50. The fabric I used was a remnant also Joanne Fabric, which I got for $2 a while ago. I've just been hanging onto it, knowing I would probably use it as a throw pillow cover. I grabbed my iron and ironing board, and got to work. I cut the fabric in half, which formed my two squares for the cover. The rest was pretty straightforward. It just involved forming my seams, lining up the tape, and making sure I ironed them well using enough heat and time. And, viola! I was done. The whole project cost me $11.50, and that was actually spread out over the course of months! So there is hope for all of us DIY home decorating wanna-be's! If I can do it, you can do it! Seriously. Every time I kick back onto this pillow, it makes me smile. Now, I just need some more Velcro, and a couple more cheap fabric remnants, and I'm all set.